Oh, I’d gladly play in that beautiful dreamworld! Oh yes! Pixie cups, how well named. I can spot their shadows in the blue spaces-marvelous. They are well named, aren’t’ they? Thanks, Elena. Cool! I’ve never seen this type of growth. Karen, you just get better and better. Canoe’s are the best! Beautifully put, Lorne. That’s very kind, Doug. I’m glad you enjoy them! Oh Karen, I’m not ready for it to go yet either, stay and play more in the light, these are wonderful! these are great. like a painting. Still summer here for another two months at least. I’m desperately trying to ignore the tiny flashes of yellow leaves I see every so often. This summer went by way too fast! Great shots. Thank you. Yes, it’s creeping up on us! Enjoy the warm days and lovely autumn. 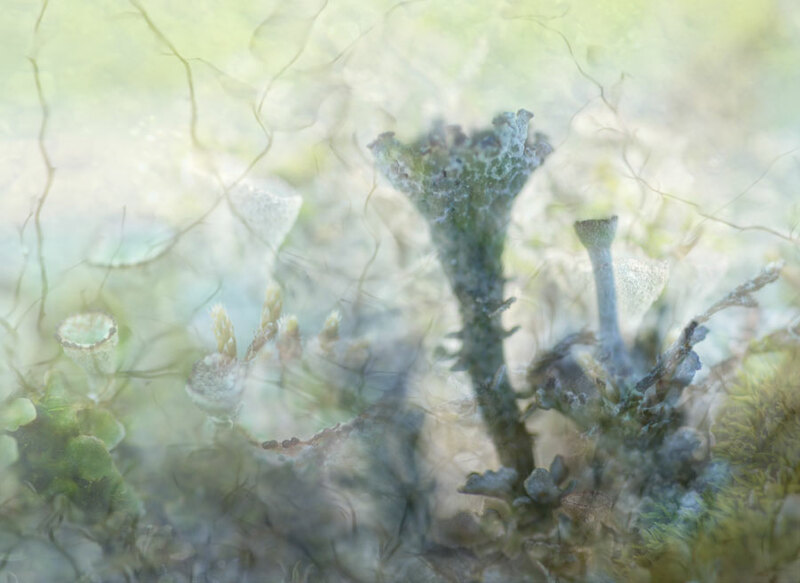 Lichen in wonderland. Wonderful, Karen. Lovely imagery. Enjoy what’s left of your summer. Thank you! Yes, still a few more weeks of lovely weather I hope. 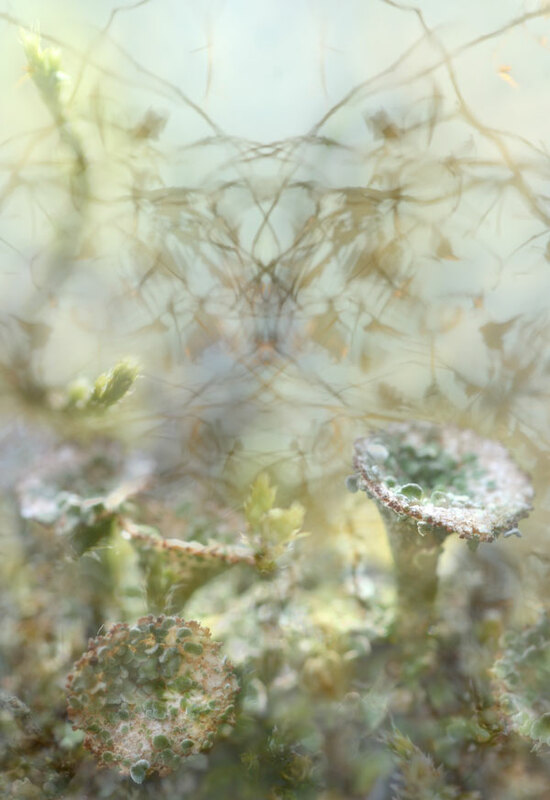 I recognized those tiny lichens – they make their own little worlds sometimes, don’t they? And then you make an entirely new one – magic! They do make their own little worlds. Thanks for your kind comment. These are gorgeous. Fungi and lichen fascinate me and I see thus is called Pixie Cup Lichen. Lovely! Lichens and fungi are so interesting, aren’t they? The pixie cups are my favourite! Thanks, Ashley. Another beautiful series Karen. I just love your focus technique. They are ‘coloured’ with a bit of water in a way. Ohh, such lovely color and light. Beautiful. These are fairyland. So beautiful, delicate and wispy. They could be underwater. If plants have dreams, these are surely they. Wonderful! 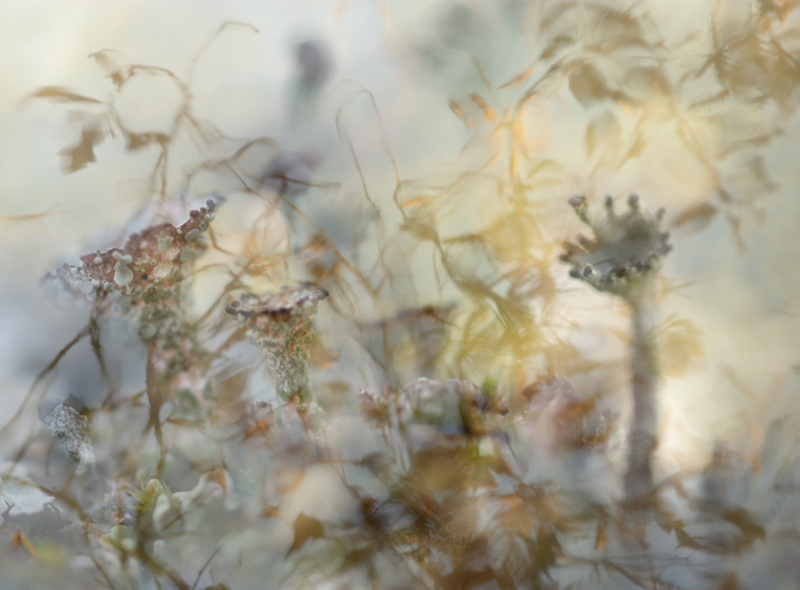 These are beautiful images – and something that I know nothing about – in this land down under! We are waiting for the sweet whispers of warm summer air but I am sorry that means plunging you back into the cold – where has the last six months gone? You take us to the most wonderful playgrounds! Hi Adrian, thank you! I do love those colours…. Love these! A world of enchantment. Yes, i find this small world enchanting, too. Thanks, Nareen. Lovely images as always, Even if they portend the summer’s ending. I am fascinated by the intense emotional quality of your pictures. They convey your deep respect and admiration for Mother Nature. Stunning photos, Karen. I love the golden light coming through slightly in the third picture. And of course, I could not help but think of jewellery (2nd picture). Oh yes, jewelry – I could see that correlation. Those are thin branches reflected on water ripples. Thanks for your comment, Dominique. Like discovering an underwater Baroque principality. Just gorgeous. A very nice thought! Thanks, Steven. Much thanks, Alessandro. You are too kind. I hope you have been having a lovely summer! Have been playing catch-up. Nice work, as usual. Karen, these are totally wonderful and amazing. The macros alone would have been something to behold, but have made a great deal more out of them than I could imagine. Total love for these! I can see anemones in them too. Especially layered with water. Thank you, I am fond of these myself. I’m glad you like them!